Since we relocated to our house in France by the beach, I have been eager to change the decoration to fit our new life and lifestyle. Not that the decoration is outdated, quite the opposite actually. I have been impressed how some areas in our home still look modern and timeless after 12 years like our master bedroom with its dark grey feature wall or the Ikea kitchen that hasn’t gone yellow despite being exposed to natural light. However, now that we have received our belongings from London, I feel it’s time to give our home a little makeover and a more beachy look. 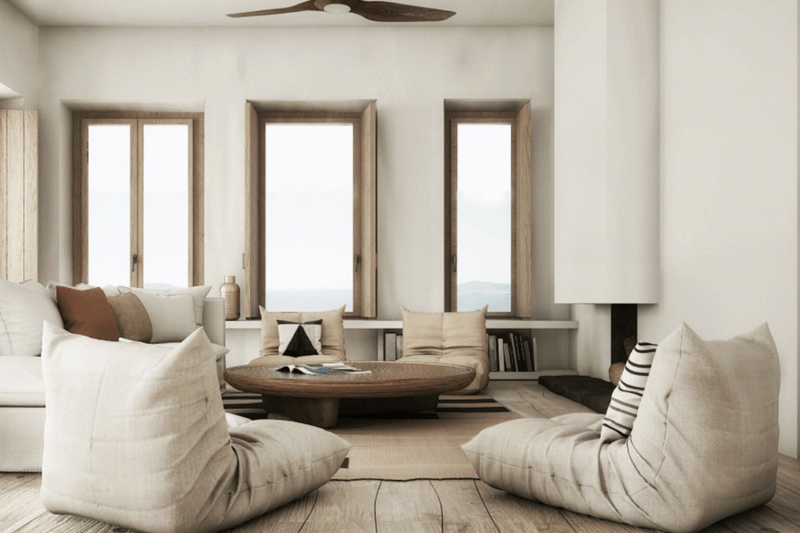 This is why I was really smitten by the natural touches highlighted in the rendering of this Mykonos residence designed by Block 722, an Architectural practice with offices in Greece and Denmark. Using a neutral palette, earthy materials, and natural soft furnishings, this residence is an invitation to wander around in one of these lovely dresses. Having used a natural lime-based paint by Kalklitir on one of the walls in our lounge to create textures (and loving the results! ), I’m keen to try out different, lighter hues in other rooms to add depth and textures like these whitewashed walls. On the subject of lime paint, there is a great section in ELLE DECO UK April issue on pages 214-215 on how to add textures to your home. The natural Wishbone chair looks at home there but did you see the limited edition Wishbone chair, Carl Hansen & Son is releasing for sale on 2nd and 3rd April? Designed to be welcoming, the house features ample lounging spaces for its residents and their guests alike. What do you think? Ready to pack your bags and escape the constant rain?